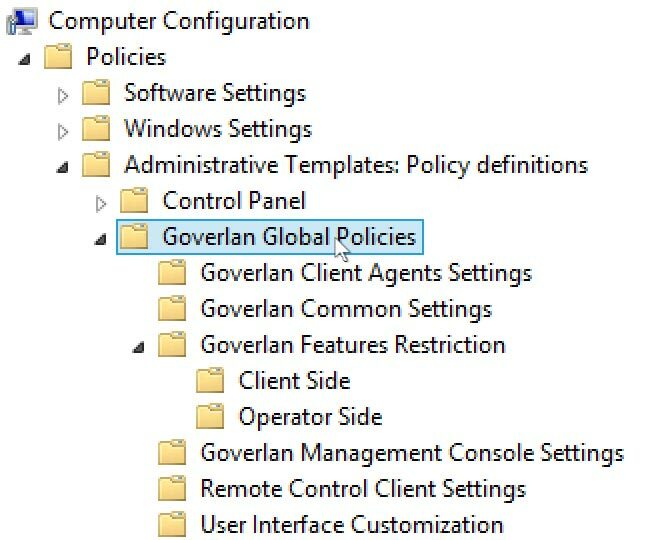 The recommended method to globally configure Goverlan is via the Global Policy Services of the Goverlan Reach Server. The Goverlan GPO is an alternative in case a Goverlan Reach Server cannot be implemented, or in addition to a Goverlan Reach Server in the event, the server is unavailable. Use the ADMX format for Active Directory based on Windows Server 2008 and later, and the ADM format for prior Active Directory. Note: If you already have a Group Policy infrastructure, skip step 1. Create the central store folder in the SYSVOL directory on a Domain Controller. Copy the GoverLAN_Group_Policy_Admin_Template.adm to any location on the Domain Controller. Create a new policy or edit an existing one. Browse to Computer Configuration → Policies → Administrative Templates. Search for the GoverLAN_Group_Policy_Admin_Template.adm and import it. Please refer to the Microsoft documentation for further instruction on adding GPO templates to your Active Directory. Goverlan Client Agents Settings Configuration items of the Goverlan Client Agents such as communication port, update policy. Goverlan Common Settings Configuration items shared by the Goverlan management console and the Goverlan Remote Control. For instance, database configuration. Goverlan Features Restrictions Restriction policies for the primary Goverlan Reach features and options on the operator and client sides. Goverlan Management Console Settings Miscellaneous configuration items of the Goverlan Reach console. Remote Control Client Settings Policies used to define the behavior during a remote desktop access session. For instance the behavior of the user acceptance prompt. User Interface Customization Customization of the text and images displayed by the Goverlan user interface on the client user side. Once you have configured the Group Policy settings, you will need to wait for them to be distributed onto your machines before you can see the text modifications. To test your settings on a client machine, open a command prompt on this one and execute a GPUPDATE.exe command.